The termites found in buildings in France belong to the genus Reticulitermes. Like bees and ants, they are organized in a society where each member has a very specific role. Tiny white individuals that move quickly, they make up the largest portion of the colony. They literally swarm inside the pieces of wood they infest. Their work involves consuming cellulose, digesting it and then regurgitating it to feed all the other members of the colony. This is what is known as trophallaxis. Always on the lookout for new sources of food, workers tirelessly prospect at full speed. They are also the ones that cause damage and that build the "cords" that reveal the presence of termites in the walls of a building while allowing them to move around obstacles without being exposed to the light. its two large mandibules used to defend the colony from its enemies, primarily ants. The size of their head prevents them from feeding themselves: workers feed them by trophallaxis. A typical sign of termite presence, swarming occurs once per year, between January and April depending on the species. During this period, hundreds of winged reproductive termites fly out of the holes dug by the workers. Couples are formed by chance. 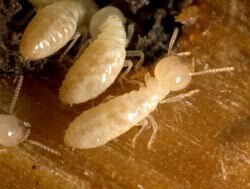 The luckiest ones land near another hole in wood and are therefore able to reproduce and rapidly create a new termite population. 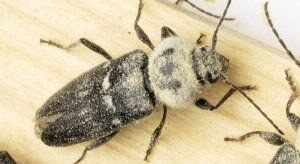 Woodworm have to be taken much more seriously in France than in the UK - partly due to the presence of termites and partly due to the fact that the House Longhorn Beetle is relatively common. It is normally pretty obvious if you have House Longhorn (also known as Capricorn Beetle, Italian Beetle, or Hylotropes Bajulus). The large oval holes (approx. 10mm diameter) are the main giveaway. Most other types of woodworm bore much smaller holes.The noise of the beetle is a clicking noise, usually audible at night. If you do have House Longhorn, the treatment will be more extensive than for standard woodworm treatment. As House Longhorn can do a lot of damage in a short space of time, the woodworm treatment fluid will have to be injected into larger dimensioned timbers, rather than just being applied to the surface. Special injectors are available for this purpose, which, I believe are actually produced by a company based in France.